Had group of three looking to bend a rod and catch some reef fish. This was another charter teamed up with Capt Harlan Trammell (Piner Wahoo) www.american-allegiance-charters.com . We run on my 32’ World Cat and he makes sure you keep on the fish. 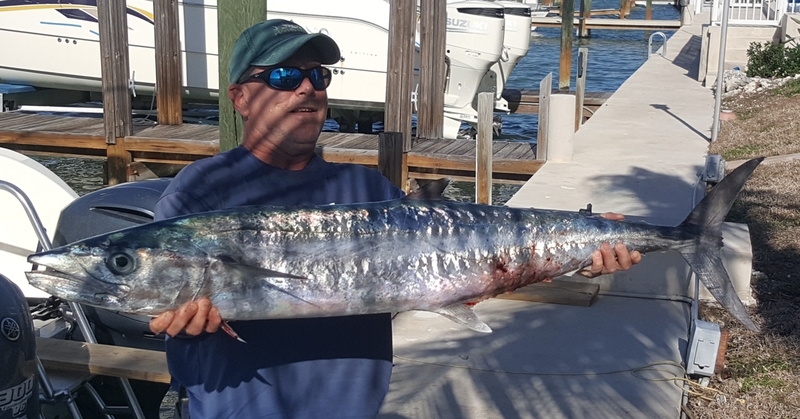 This started out as a reef trip but with the full moon coming we wanted to try for a Wahoo. Left the dock at 7 am and headed east along shore to make it a little more comfortable. Turned south and did not find good blue water till about 350’. Set up the spread and turned with the wind. Trolled back and forth from 350 to 200’ and the water got better as we went west. There were lots of weeds (gulf grass) running north and south. Found a temp change around 250’ with good color and finally got a knock down. Was not the hoo we were looking for but a black fin tuna in the box. This group also wanted to do some reef fishing so 3 hours was our trolling limit. As we started turning toward shore and the left long went off. 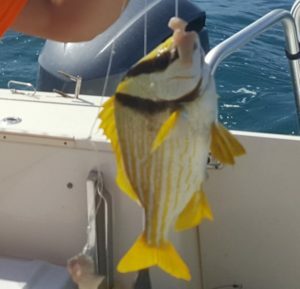 The fish did not put up much of a fight and it turned out to be a Spanish mac in 250’ of water. Started back to reef and left the lures out looking for a bonita. Wasn’t long before we had a fish on and it was fighting much different that a bonita. After a good battle Bill gets a huge king mac to the boat. Quick gaff and into the box. Now to set up on the reef after we find some goods marks on a 65-75 drop-off. Anchored up and started chumming. Drop a chicken rig down while waiting for the chum to disperse. Got a few behind the boat and we picked up some TY, porgy and pork fish. Wind was strong but the current was dying. Also dropped a live one down on bottom rod. Got rocked up and cut off several times. One time got the fish stopped and was slowly working it away from rocks. Good battle for about 10 min then the line broke. Acted like a big jew fish. Time to clean the catch and the boat. Had a great day on the water with 3 new friends.